Body Transformation: She Shed 103 Post-Pregnancy Pounds! Some people have the will to accomplish amazing feats. Christina is one of those people. This mother of two lost more than 100 pounds and built a pro bikini physique! I'm a business owner, wife, and mother of two. I am 4-foot-11 and was always fit until I had my first son. 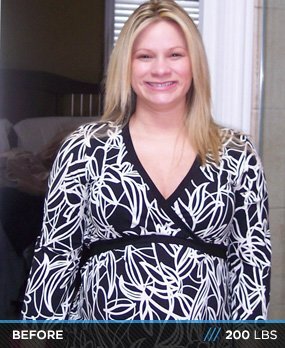 The day I gave birth, I weighed more than 200 pounds. 21 months later, I gave birth to my second son and weighed 185 pounds. After the birth of my second son, I said enough is enough. I had to get the weight off so I could be around for my boys. I bought a pair of Nikes and started running for about a year. I ran 5ks and a half marathon. I felt like a million bucks crossing the finish line, but wanted more. I wanted to feel good in a bikini again. I lost weight, but my body shape didn't change. I started researching and came across Bodybuilding.com. I learned a lot about weightlifting and supplements from Bodybuilding.com and joined a gym. My trainer said I should enter a bikini or figure competition. I laughed, but entertained the idea. I went back to Bodybuilding.com and read about competing. I thought there was no way I would ever get a body like that or find the time. I stumbled onto body transformations and was amazed. If those women could do it, so could I. So, I did. A friend with competition experience told me to get a coach. She gave me names, I found a coach, started the diet, prepared the meals, did the workouts, practiced the poses, and stepped on stage. My first competition was at the 2012 ABA Natural Illinois Bodybuilding, Fitness and Figure Championships. I took first place in Masters 35 and over, the overall in masters 35 and over. My second competition was the NPC Fox Cities Showdown. I took second in open, which qualified me for nationals and The Arnold Classic in 2013. My third competition was the NGA Heart of America and I took third in open. It's an unbelievable feeling. Not only did I win trophies and qualify to compete nationally, but I walked on stage 100 pounds lighter than I was when I gave birth to my first son. I joined Team F.A.B, and with the help of my coaches Staci Boyer and Sandy Wiedmeyer, I was given the tools to succeed (diet and exercise plans). I took progress pictures every Friday and updated my coaches on my progress. The diet was the hardest part. I'm lucky to have a fast metabolism. There were days I just wanted to quit; it's easier to be fat. Then, I'd think about my kids and the pain of losing a mom. My mother died at 46-years-old. She was overweight and unhealthy. I made the decision not to follow in her footsteps. Once I made the decision, it became easier. With team, family, and friend support, I was unstoppable. My nutrition plan changes from time to time depending on where I'm at with prep. I drink a minimum of one gallon of water per day. My training is subject to change weekly depending on where I am with prep. I do lower body twice a week because it's my most stubborn area. Dieting was the hardest part by far. I have a major sweet tooth, so I went through my house and threw away anything that tempted me. My family was very supportive. Peanut butter became my favorite sweet. It was in my diet, so I looked at it as a reward. I have one more competition planned for 2012 and I'm signed up for The Arnold Classic in 2013. One day, I would like to go pro. I love everything about competing, but my main goal is to inspire people to do what they never thought was possible. Anything is possible. I was 200 pounds in 2007. In 2012, I walked onstage 100 pounds lighter. If you want it bad enough, you will find time. I'm a wife, a mom of two beautiful, rambunctious little boys, and I run my own business building bridges. I have a very hectic life, but I made it happen. I premade my meals, carried a cooler, and treated my gym time as an appointment I couldn't miss. Transformations on Bodybuilding.com helped me believe I could look the way I do now. Bodybuilding.com has many resources that helped me along the way. Forums were a great place to purchase supplements and workout gear.